The North West Passage seems to be reversing its recent warming trend and is threatening to end the dreams of dozens of adventurous sailors. A scattering of yachts trying to transit the legendary Passage are caught by the ice, which has become blocked at both ends and the season may be ended early. 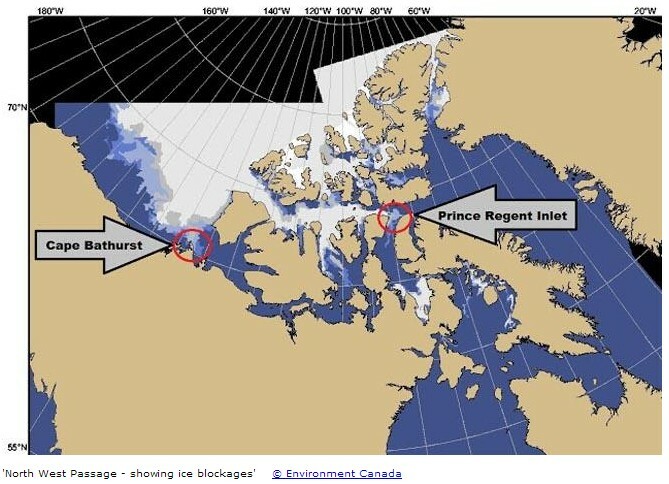 Douglas Pohl tells the story: The passage has become blocked with 5/10 concentrated drifting sea ice at both the eastern and at the western ends of Canada’s Arctic Archipelago. At least 22 yachts and other vessels are in the Arctic at the moment. Some who were less advanced have retreated and others have abandoned their vessels along the way. Still others are caught in the ice in an unfolding, unresolved drama. This is what happens when you listen to breathtakingly ignorant government experts. Temps do not look like the Ice will melt and more in the area this season and lots of new snow cover has covered the land. The USCGC Healy is not far away but they taking the Teachers to North Pole ice crushing adventure. There is a Chinese cargo ship on the Russia side that may be waiting for Russian Ice breaker to open shipping route. This is from Aug 12 but the ship is out there some where now. Thanks also for the credit..
Not only waiting for Russian Ice breaker. The Yong Sheng is escorted by the Russian Ice Breaker 50 LET POBEDY since the 28th of Aug.
Am new to reading ice charts, and from what I can see it’s not as bad as the article stated. If you have a row boat and are willing to drag it in shallow waters then maybe you can get by the ice. The arctic rowing team did the for 100km this year. What I’m seeing is the drift of the ice to the northwest. Don’t know about the water depths in the area, but motoring close to shore might get you past the ice while it retreats to the north west. Just trying to learn. It’s a whole new set of problems to solve. Well not really…but i think if you looked at your ice chart, and then visually saw first hand what that 20 % looks like from aboard ship, you’d probably say ” Holy &*^+ “. Looking at the eastern end of the passage, it also looks like you can “sneak” through but several boats have turned back and more are idling by. While the charts are a great help, I’m sure there are always little unseen fingers of ice pack that come and go and could reek havoc with a boat. If you get pinned in somewhere….you have a very serious problem. You also can’t make any speed (headway) amongst ice, because the harder you hit it, the more likely you are to be sunk. John Kerry should have been one of those yacht owners, if he were not one of the biggest liars in the history of the universe. from the Canadian Media …..crickets…. Let’s call this a learning experience for those boat owners. Maybe it is their Karma. Yeah, their Ma should get them a car. Now how are the alarmist and all those so called scientists going to argue this one? How did manmade CO2 do that? And how many computer climate models projected that this would happen – my guess zero. And zero is the amount of credibility left in the ‘CO2 causes AGW/CC/ Climate-whatever’ fantasy that has gripped too many idiots for too long. Does that mean the Cambridge bay yacht club is closed for the season? Get ready for the winter from Hell! Floating limousine liberals getting the karma of their own media lies. Because who could EVER predict the Arctic would be chock-full of ice? Slightly off topic but record August snowstorm is forecast for Iceland over Friday and Saturday. Ice breaker USCGC Healy is at the Western edge of the passage. Animation of the ice from Canada. Can’t they just get their hockey sticks and bust their way out?